Months of catching Mel and Thora just as they log off, it was like the sheepdog and the coyotes clocking in and out in a cartoon. So worth it though as I am now able to chew in public and make a mess of myself, these are SLife Goals! 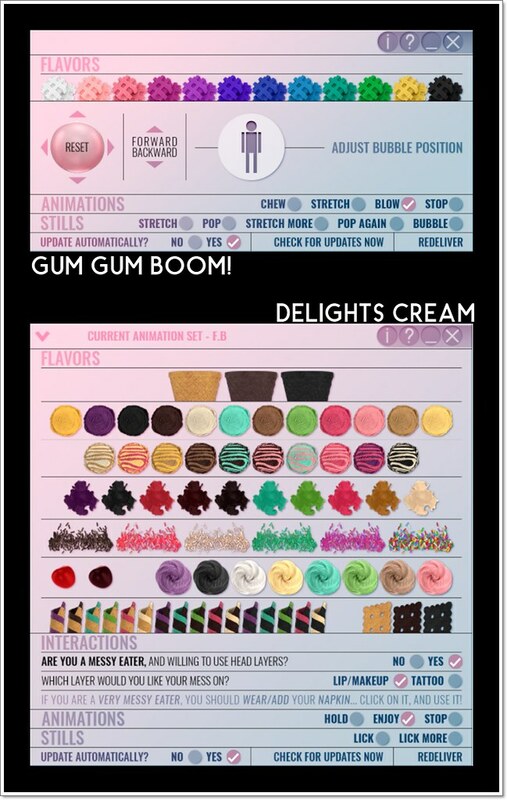 What am I talking about, well the LeLutka Oral Fixation release is only days away, and the first two items are the Delights Cream and the Gum Gum Boom. These are interactive treats that work with your LeLutka Bento heads and are so much messy fun. The Delights Cream has a huge assortment of flavour choices, I changed my mind four different times during my pictures then asked Mel to change his gum flavour so we could be matchy. Once you get all your flavours and toppings sorted you then have to make the executive decision to be a clean eater or a messy eater. You wear the napkin that is included if you go with messy and once you choose messy you select which face layer on your LeLutka head that you want to mess. Then the fun begins, as you click on to enjoy the Delights Cream is randomly brought to your mouth, you like, you devour and then also randomly you may end up with either a small bit of Delights Cream on your upper lip or look out full on messification. The animations will lick off the mess or the handy napkin will wipe you clean and take all the mess to its soft folds. You can have a break by selecting hold, or stop altogether, then if you want to take some still shots, you can use the lick or lick more buttons on the HUD. Then with the Gum Gum Boom that Mel is wearing, you have all different flavours of that also, then you can adjust as needed – remember to wear the gum size that is the same as the teeth size you wear with your head – and you can chew only, stretch which I love love, and blow which is all three with bubbles. Stretch is my favourite because its just pushing your tongue through the gum which a lot of people do with chewing and bubble gums. The variables are random and entertaining, I love the animations when the gum pops and how it maneuvers back into your mouth with the chews having the gum also move around in there, it is great to have that much realism. I look forward to more Oral Fixation items from LeLutka, these will be released at the start of the new week, so be ready.